The other day I was doing some surname searches through Bing and Google images. A newspaper clipping came up that looked interesting. It linked to a summary page at Ancestry.com about my ancestors, but the information was wrong. It looks to be a summary from a collection of records. Below this information was suggested photographs and documents for this family. There were no sources to show where this data is grabbed from. This is my family, but to my dismay, some of the information is incorrect. My great grandfather was not American. He was Portuguese, thus, he had a Portuguese first name. It was Theodoro not Theodore. My great grandparent’s surname was Pacheco. Around 1907 when they left Hawaii for California, they changed their family surname to Pacheco Smith. Theodoro had three brothers who adopted the surname Algravia and the variant Algarvio, but they were born with surname Pacheco. The new surname didn’t make an appearance until after 1900. And, it was used inconsistently. One brother dropped it after a dispute with his brother. Some of the children of these three brothers adopted a variation of this surname. They used Algrava and Algarva interchangeably. Only a small group were born under this surname. Algrava and Algarva are made up surnames Everyone in the US leads back to this family in some form or fashion. But, not my line. It bothers me that my great grandfather’s name is listed as if it were official. 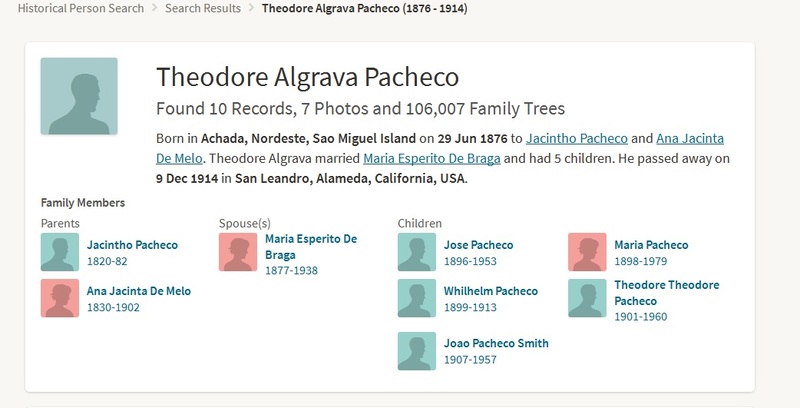 Future genealogists will never find Theodore Algrava Pacheco in records because he did not exist. His information isn’t the only one that is wrong. His wife was Maria Espirito Santo de Braga. They’ve left off the Santo. His son was not Theodore Theodore Pacheco. And, technically, the De should not be capitalized, but we’ll let that slide. Now, I know I am not the first person to complain about things. And, I don’t want to discourage people from researching or from sharing their trees for fear it might be misrepresented. If we all keep our information to ourselves, we’ll never learn from each other. Collaboration is a wonderful part of genealogy! However, this is a good example of why even when family data is summarized and presented by a reputable institution as fact, it must be verified. Anyone who comes across this data shouldn’t accept it as gospel. They should analyze it, digest it, question it, and then find the original sources to prove or disprove it. I have my tree online at Wikitree for the whole world to see. People are welcome to view it, copy it, add it to, and question my data. But, please, if you are adding my information to you tree, record it as you see it. Don’t make it conform to what you want it to be. If you find that I’ve made an error, let me know. I’d be happy to fix it. And, if something doesn’t sound right, question it and research it. Then, let me know if you found something different. That way we all learn. We all make errors. I’ve made them myself multiple times. Family lore still needs to be proven. Indexes need to be verified by source documents. Source documents need to be compared and analyzed because people who record information make mistakes, too. Let this be your challenge. When you find your family’s information online, use it as a basis to begin your research. But, don’t take it as truth until you can prove it.